If you’re the sort of person who loves that cozy feeling of a cat wrapped around your neck, then look no further. 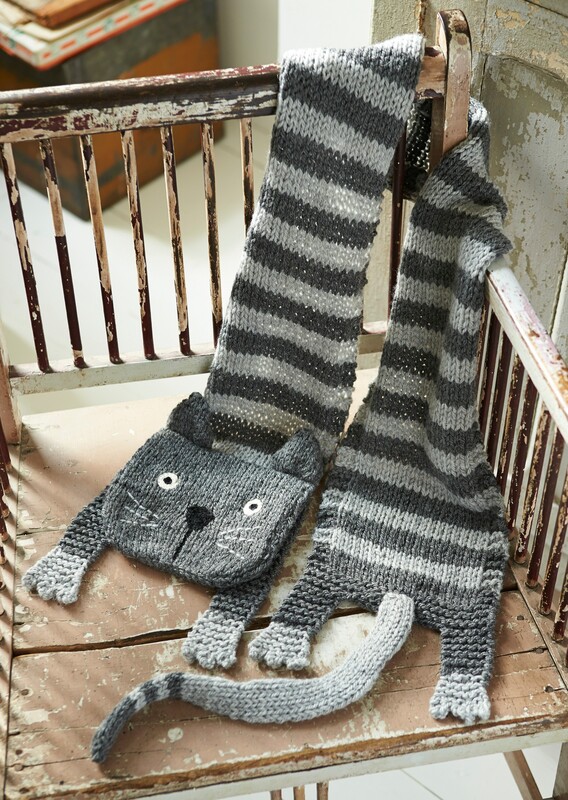 This is the perfect scarf for you. 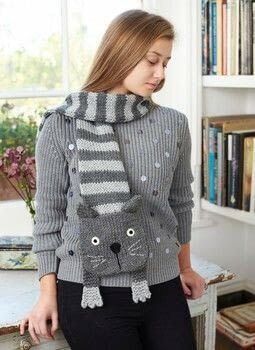 It’s knitted in a chunky yarn, in straightforward stockinette (stocking) stitch, so you’ll find it grows pretty quickly. And the stripes are just enough work to keep you on your toes. The scarf is very simple to customize. So if you, or the lucky scarf recipient, have a white cat, choose white or cream yarn. And for a marmalade cat, knit in shades of rust and coral. 14 sts and 19 rows in stockinette (stocking) stitch to a 4-in (10-cm) square on US 10½ (6.5mm) needles. The finished scarf is 50in (127cm) long, including the back legs. Beg with a k row, work 21 rows in st st.
Leave A at side of work and join in B.
Rep rows 28–29 once more, carrying A up side of work at beg of row 30. Leave B at side of work and use A. Row 33: K3, p to last 3 sts, k3. Rep rows 32–33 once more, carrying B up side of work at beg of row 34. Rep rows rows 28–35 (last 8 rows), 23 times more. Cont in A, knit 6 rows. Row 226: K6, bind (cast) off 12 sts, k to end. Cont on 6 sts just knitted only, leaving rem sts on needle. Next row: K2, turn and work on 2 sts just worked only. Bind (cast) off 1 st [pick up and k 1 st from row ends, bind (cast) off 1 st] twice. Rejoin A to rem 6 sts on WS of work. Shape paw as for first back leg. Shape paw as for back legs. Beg with a k row, work 20 rows in st st. Cast on 10 sts in A.
Beg with a p row, work 2 rows in st st. Cast on 11 sts in B.
Beg with a k row, work 32 rows in st st.
Beg with a p row, work 9 rows in st st.
Leave B at side of work and join in A.
Rep last 4 rows in two-row stripe patt as set. Break B and work remainder of tail in A.
Beg with a k row, work 8 rows in st st. Break yarn, thread it through rem sts, and pull up securely. On face, using black yarn, embroider two small circles using chain stitch for the centers of the eyes. Work two rows of chain stitch around these circles using off-white yarn. Using black yarn, work a triangle shape in chain stitch for the nose and work a line of chain stitch from the base of the nose to the lower edge of the face. Separate a length of B into two thinner strands and use them to embroider the whiskers in backstitch. Place the face on the head part of the main scarf so that the right sides are together. Oversew the side seams. Turn the head the right way out and sew the top edge in place using mattress stitch. Oversew the front legs in place underneath the head, where the head meets the main part of the scarf. Fold the ears so that the right side of the front and back pieces are together and oversew the two sides. Turn the right way out and sew the lower edge together using flat stitch. Oversew the ears in place using the photograph as a guide. Sew the back seam of the tail using flat stitch. Oversew the tail in place in the center of the cat’s lower end, just where the garter stitch border meets the main part of the scarf. Wish I knew how to knit. So adorable! 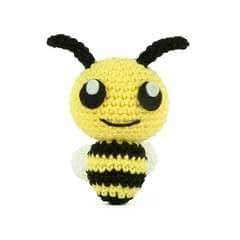 I don't knit but wonder if you have a crochet version of this...it's so cute. Lost my 20 year old kitty a while back and I'd love to make this for myself.